Quick post this morning as I am off to the RHS Chelsea Flower Show today. I'm really looking forward to it as I am really into my garden at the moment and I will share pictures from the day at the show later this week. 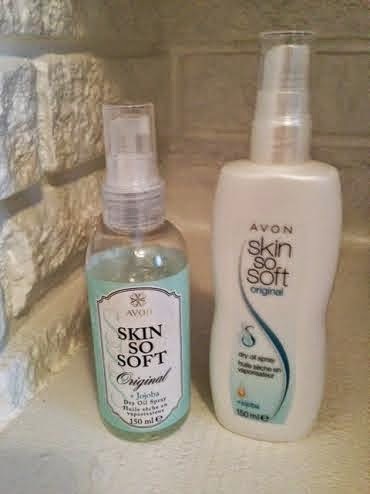 Avon's Skin So Soft Dry Oil Spray. As Avon is celebrating over 50 years of the 'Skin So Soft' brand, they have released a limited edition vintage version which is super cute and looks lovely on by beauty stand! Avon claims it's the UK's favourite dry oil spray and it is one of their biggest sellers. It contains Jojoba oil and is designed to lock in moisture when applied to wet skin (a bit like Johnson's Baby Oil). I have never applied it to wet skin as I find that I just end up wiping most of it off with a towel as I haven't got the patience to wait until it's all absorbed, but to dry skin it works just as well. It sprays on as a fine oily film but absorbs very quickly and leaves my skin feeling really soft and smooth. It has a lovely subtle aroma too which is not overpowering and does not interfere with any perfume that I wear. I always pop it in my work bag as it is great for when you get dry elbows/ankles during the day and need some quick moisturisation. It's also so quick and easy to apply. Just spray, rub in and go! The biggest draw for many people including myself is that it also works as an insect/mosquito repellent! It has some sort of ingredient in it that is really effective at keeping midges away. Rumour has it that the US military use Skin So Soft Dry Oil Spray because of this reason and many people include it as their must-have holiday item. I always make sure I spray some on just before I go into the garden to do some gardening as it really does repel those little bugs who like to bite! It comes at such a reasonable price (normal price £5) but there is sometimes a special offer on them which makes it even more of a bargain. There is a range of other products within the Skin So Soft brand, however the Dry Oil Spray is my favourite. Contact your local Avon representative for availability.